We have been working hard to make our broadcast solutions cover all the processes from Ingest, News Production and Media Management to Automation, Distribution, Second Screens, Business Intelligence and much, much more. Now is the time to start over, rethink and take your Company from the traditional End-to-End system to Anywhere you can imagine. Now is the time you might want to have one of our consultants take a look at what you can achieve. Web-based state-of-the-art solution for managing multimedia content with all the needed features for ingesting, quality control, cataloguing and managing projects in most NLEs available in the market. All of it, using the latest technologies, with an open, flexible and scalable architecture, guaranteeing maximum freedom and autonomy to the client and providing enhanced workflows to optimize resources and increase productivity in any audiovisual company. Complete automation workflow for production and broadcasting of news and sports in a uniform and organized environment. This solution provides total reliability and robustness for 24/7 broadcasting. The suite of solutions also includes a scheduling module and an advanced WebTV management. 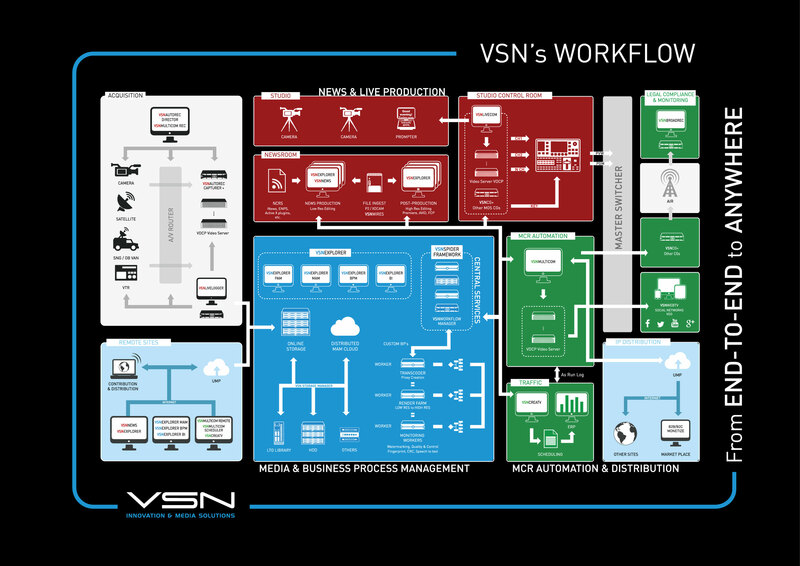 VSN’s product portfolio provides a complete suite of broadcast solutions covering the main areas of audiovisual content PRODUCTION, MANAGEMENT and DISTRIBUTION. A full end-to-end broadcast solution, covering news and live production, media asset management, MCR and studio automation for live broadcasting and second screens distribution. A modular, scalable and easy-to-integrate platform, ready to work on cloud environments, that adapts to your needs and guarantees a high return on investment. VSN Broadcast Solutions are used by over 1000 clients all over the world. Would you rather want a live demonstration of VSN's Broadcast Solutions? We will be happy to show you a live demonstration of our solutions. Learn how to optimize your End-to-End system by solving the Broadcast Puzzle! Watch the webinar and discover how the complete Media cycle operates in any given Broadcast or Media & Entertainment facility.